Lil' Inker: Stock Update & Eye Candy! Stock Update & Eye Candy! Hello there! I wanted to stop by quickly today to let you know that if you have been waiting to order a Sentiment Flags die and stamp set, you may be in luck! I am planning to get a small quantity back in stock in the very near future, so please stay tuned. I should know for sure by the middle to end of next week. And did I mention what FANTASTIC stocking stuffers this little bundle makes for the crafty friends in your life?! I mean, seriously fabulous, right? 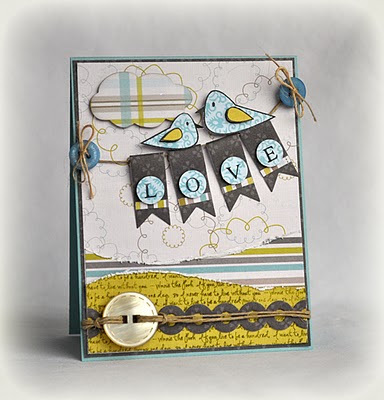 Amy made this card using stamps from Verve's new release called Wordy Birds and Text Objects. 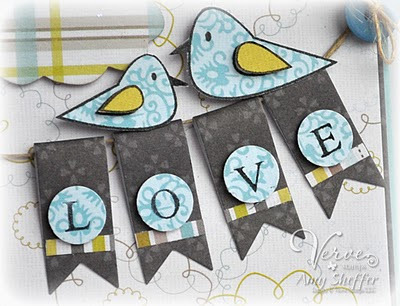 I can't think of a more creative way to use Sentiment Flags....birdies on a wire? LOVE LOVE LOVE! I think it's really cool that Sentiment Flags has so many versatile uses and can coordinate so well with so many of your favorite stamps! To read more about Amy's card, please visit her blog HERE. Thank you to Amy Sheffer and Julee Tilman of Verve Stamps for allowing me to use their images in my post today! MWAH! Text and pictures © Laura Pryor; All rights reserved. Nothing may be copied or changed without requesting my permission. I ask that you please not copy for submission to contests, magazines etc. Feel free to CASE and let me know if you do!